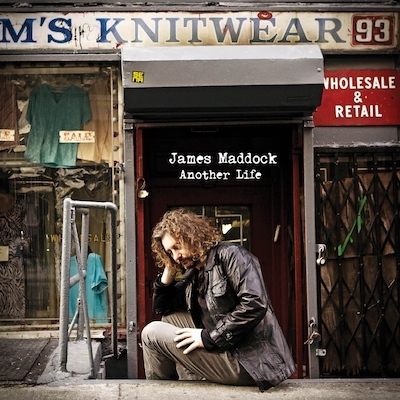 ‘ANOTHER LIFE,’ THE BRAND NEW ALBUM FROM JAMES MADDOCK IS NOW AVAILABLE! The wait is over! Another Life, James’s brand new album on Jullian Records is available TODAY. You can purchase a copy for yourself on digital retailers, including iTunes and Amazon. The physical album is also available online in the James Maddock merchandise store. Click HERE to head there now and be one of the first to have the album sent right to your home. This includes those fans living outside the US – don’t worry, we didn’t forget about you! Our deepest gratitude to everyone who donated during the PledgeMusic campaign -- this album would not be possible without your donations and support. We thank you for believing in this project and for being a part of the journey that has brought Another Life, well, essentially to life! Again, let us extend a big welcome to the all-new James Maddock website. Continue to explore and check back often for content and all sorts of updates. To find out when James is playing in a town near you, visit the events page for a list of upcoming shows by clicking HERE. You’ll notice that James has two in-store events this week in celebration of the release. If you’re in the area, come on out for a special in-store performance and signing, first at Looney Tunes on Wednesday July 24th, and then at Vintage Vinyl in Jersey on Thursday July 25th. Both events begin at 7PM. See you there? Finally, take a moment to sign up for the mailing list if you haven’t done so already. You’ll be the first to receive all of the latest Maddock updates right to your inbox! We leave you with the Another Life Official Album Trailer embedded below. We hope you’ll watch it and share it with the James Maddock fans in YOUR life.